Guerlain Les Parisiennes Mon Precieux Eau de Parfum, 4.2 oz. GuerlainLes Parisiennes Mon Precieux Eau de Parfum, 4.2 oz. Mon Précieux Nectar belongs to Guerlain's Exclusive Collections, a range of fragrances for aficionados of rare scents, those who appreciate noble raw materials and refinement down to the last detail. 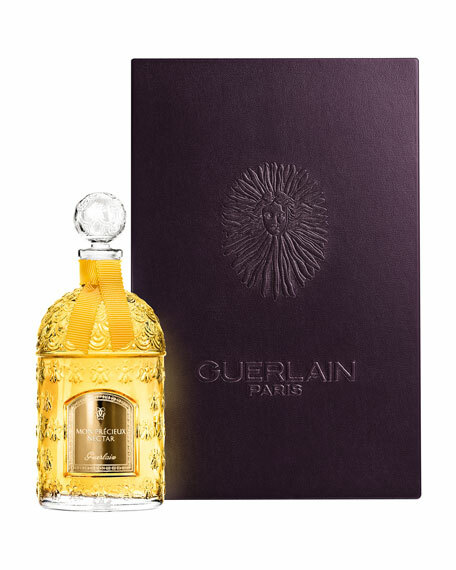 The Exclusive Collection is only available in the Guerlain boutiques in Paris, as well as Guerlain. The fragrance is showcased in the iconic Bee bottle, which exceptionally takes on an oh-so-chic 125 ml format. The bottle nests in an amethyst leather feel case (that can be turned into a jewelry box as you wish). 2009 re-edition. The Les Parisiennes collection is composed of exclusive re-editions of fragrances belonging to Guerlain's heritage at the demand of their fans, who couldn't bear the thought of going without them. Real perfumery treasures.